Hummingbird Cake Recipe. Plus a Sugar-free Version. This Hummingbird Cake Recipe does not contain any hummingbirds, we promise! How did this cake get its name. No one really seems to know for sure. Many believe it was originally a Jamaican Cake and their native bird is the hummingbird. It definitely contains the essence of the tropics with its bananas and crushed pineapples. In folklore, the hummingbird is the symbol for sweetness. This cake is ultra sweet and rich, making it perfect for family gatherings this summer. 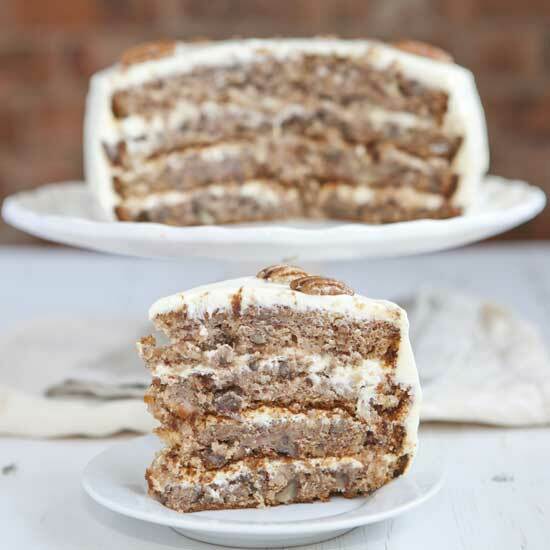 This hummingbird cake recipe is wonderfully moist and has won many awards. So in honor of the hummingbirds, we are giving you a recipe that is super easy and special. You don’t even need a mixer, just two bowls. Now that’s my idea of summer cooking. It is quick and freezes well too. So you can make it ahead for your picnics. Preheat oven to 350 . Sift flour, sugar, salt, baking soda and cinnamon together into mixing bowls several times. Add eggs and salad oil to the dry ingredients. Stir with a wooden spoon until the ingredients are well moistened. Then stir in the vanilla, pineapple and 1 cup pecans. Now stir in the bananas. Spoon the batter into 3 well-greased and floured 9-inch round cake pans. Bake for 25 to 30 minutes, or until a wooden pick or cake tester inserted in the center comes out clean. Cool in the pans for about 10 minutes, turn onto cooling racks. Be certain to cool completely before frosting. Yum! Combine cream cheese and butter. You need to cream until smooth. Add the powdered sugar, beating with an electric mixer until light and fluffy. Stir in the vanilla. Frost the tops of the 3 layers, stack them and frost sides. Sprinkle the top evenly with the ½ cup to 1 cup chopped pecans. I, Ruth, (the better half of The Hummingbird Guide, ha ha) am a Type 1 diabetic. There is an irony to this for us diabetics, isn’t there. Hummingbirds love sugar! We diabetics do not eat a lot of sugar. So I have adapted the traditional recipe for us diabetics. This recipe has been tried and I can attest that it is delicious. Preheat oven to 350 . Sift flour, Splenda, salt, baking soda and cinnamon together into mixing bowls several times. Add eggs and salad oil to the dry ingredients. Stir with a wooden spoon until the ingredients are well moistened. Then stir in the vanilla, pineapple and 1 cup pecans. Now stir in the bananas. Spoon the batter into 3 well-greased and floured 9-inch round cake pans. Bake for 25 to 30 minutes, or until a wooden pick or cake tester inserted in the center comes out clean. Cool in the pans for about 10 minutes, turn onto cooling racks. Be certain to cool completely before frosting. I do plan to experiment with other low glycemic sweeteners in the future as well. I will publish my results. I don’t mind trying and tasting this luscious dessert one bit. If anyone has suggestions, I’d love to hear them. Meanwhile I plan to enjoy my hummingbirds. They are the sweetest creatures of them all. This recipe contains no sugar. Truvia is a natural low glycemic sweetener. Notice that the amount of Truvia is much less. Beat the cream cheese, butter and vanilla in a bowl. Add Splenda and powdered sugar. Beat until smooth. Spread on cake. Sprinkle with desired amount of pecans. Yum! Remember this recipe does have some sugar.